Color of the Month! Summer Fall-Out! I can't believe it's time again for color of the month! 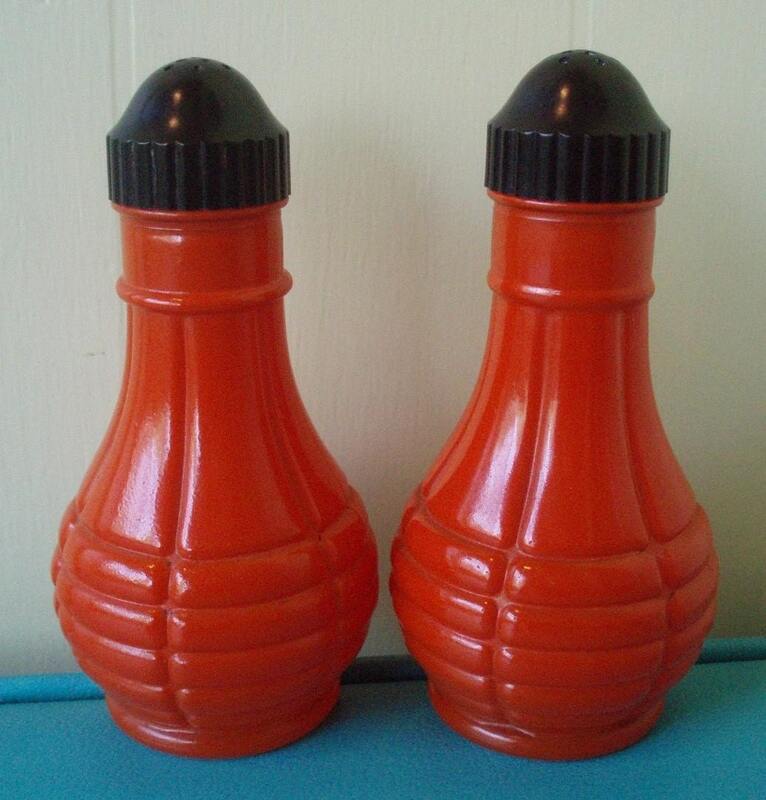 This time it's ode to red orange. It reminds me of the summer heat but gets me ready for the fall color to come. I know, you don't want to think about fall, me neither, but it's coming, and beloved summer is slowly slipping away! The weather is beginning to get a bit cooler, schools starting up again, and it's time to harvest goodies and soon enjoy fantastic fall colors such as these! 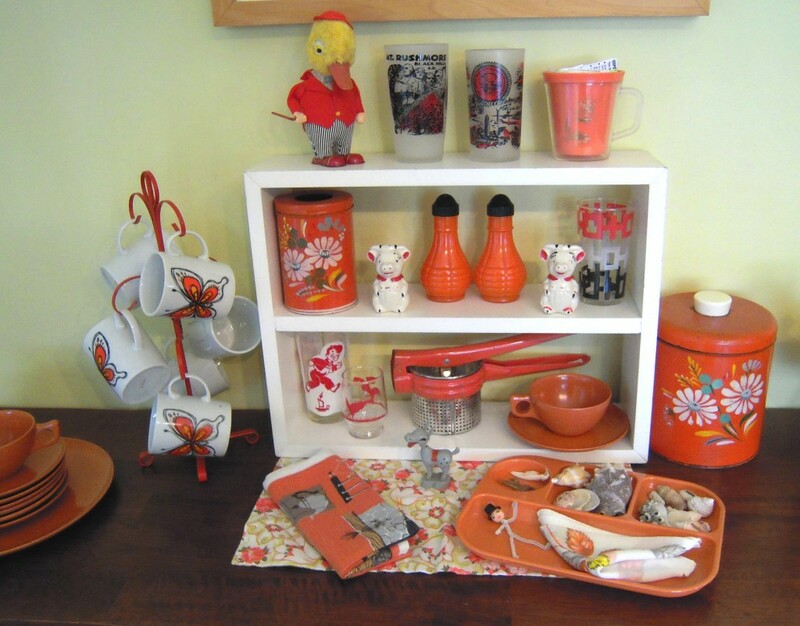 And any way you stack it, red orange will give you a great boost of color year round! These great thermal cups will take you from summer to fall! I love the little star design! 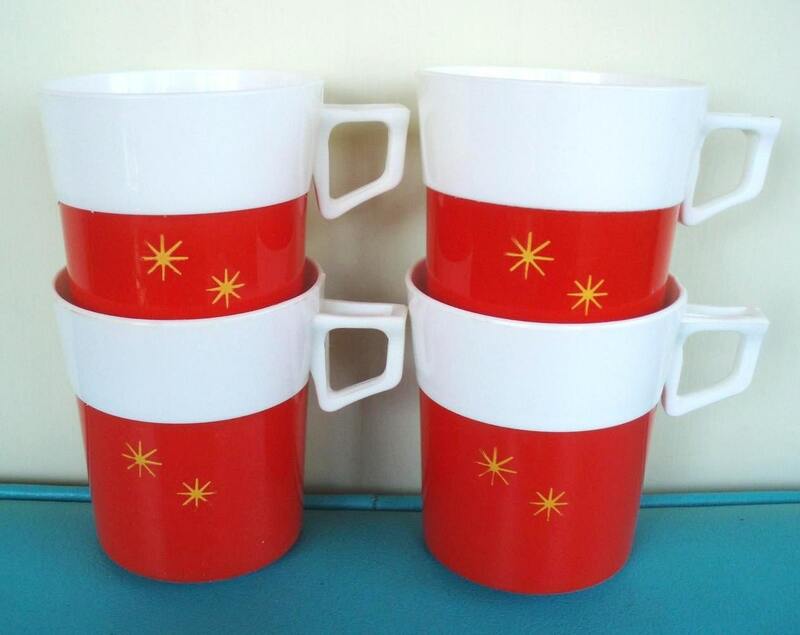 And you can serve up hot or iced tea and these cups will be perfect for both! Don’t worry, there’s still plenty of time left for lobster boils at the beach! 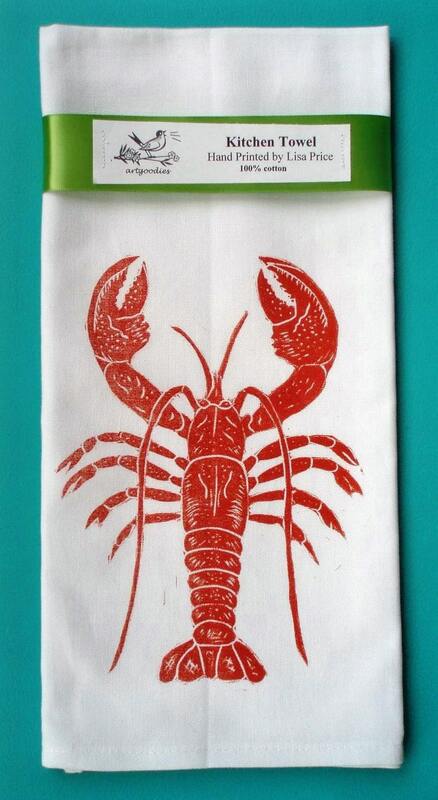 This fantastic artgoodies lobster block print towel is perfect for a beachy place and will remind you of great summertime fun year round! 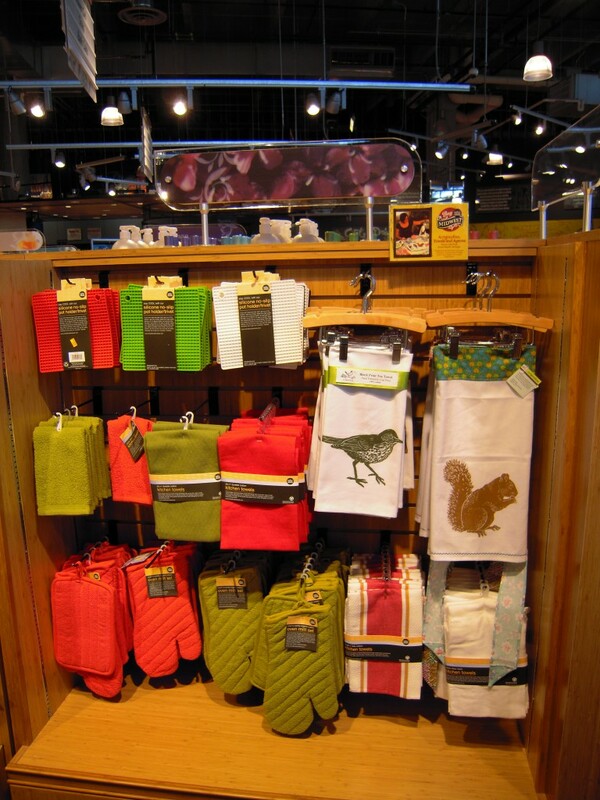 These large scale glass salt and p’s will hold plenty of seasoning for family get togethers! 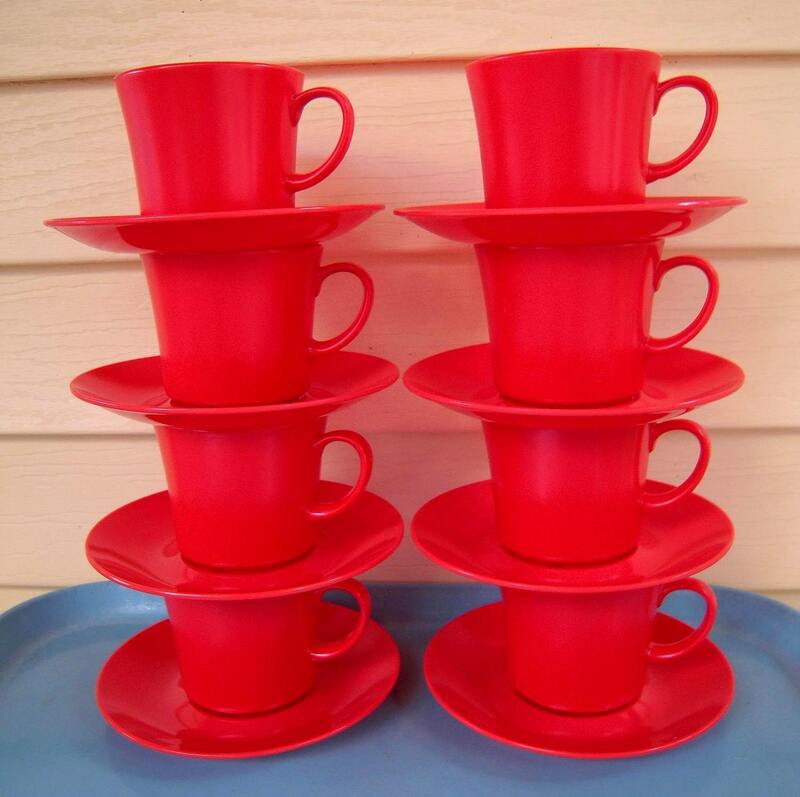 This set of red orange melmac cups and saucers are the perfect thing for all your entertaining needs! Perfect for some cider! 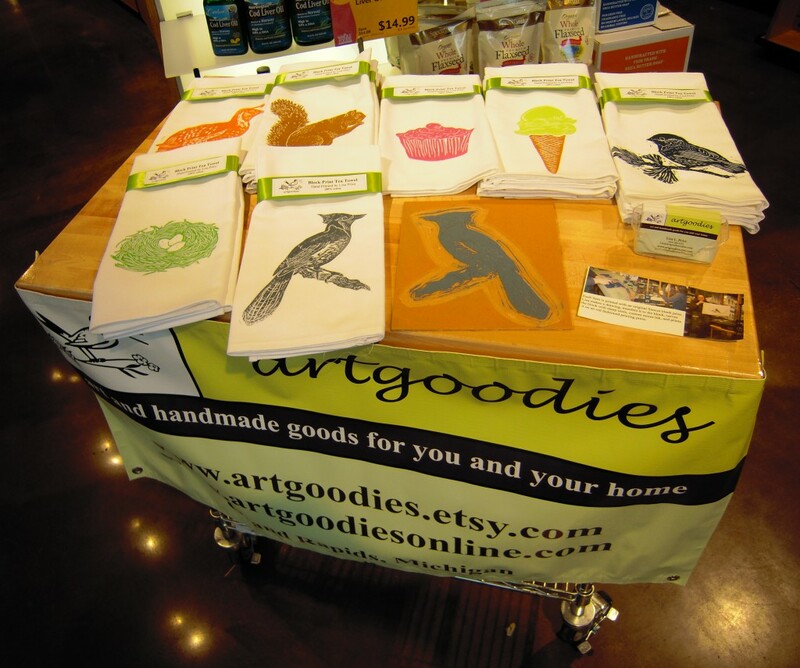 Here's a close up of artgoodies at the Kingsbury Square Whole Foods Mega Store in Chicago! It's the largest one in the US and let me tell you it's GIANT. I was told it's 90,000 square feet. If they had showers and bunks you'd really never have to leave! There's even a bar, a wine and cheese bar, a diner, and a whole bunch of other fab food places besides the amazing groceries! They invited me down to talk to customers on their local vendor demo day! Here’s what the set looks like! 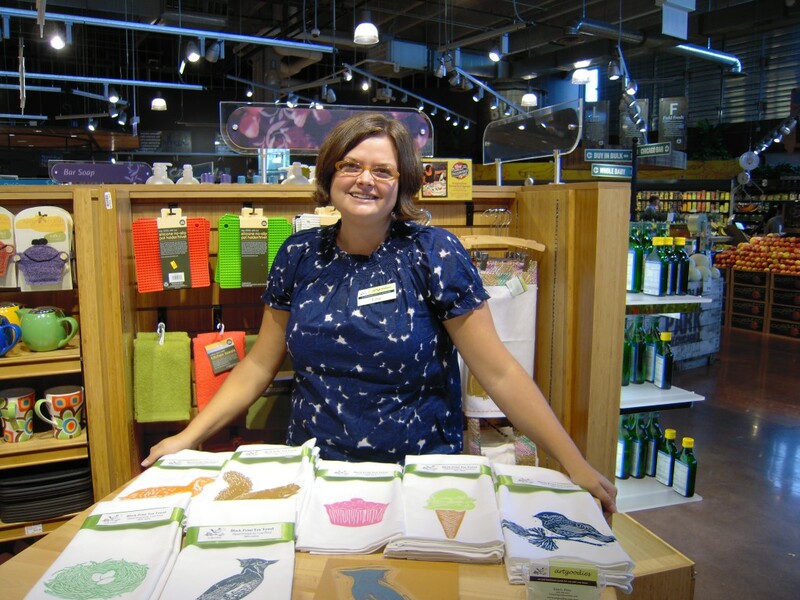 Right around the corner from the produce, and there’s a little buy Midwest sign too with a pic of yours truly! Snazzy! Here’s my demo cart. 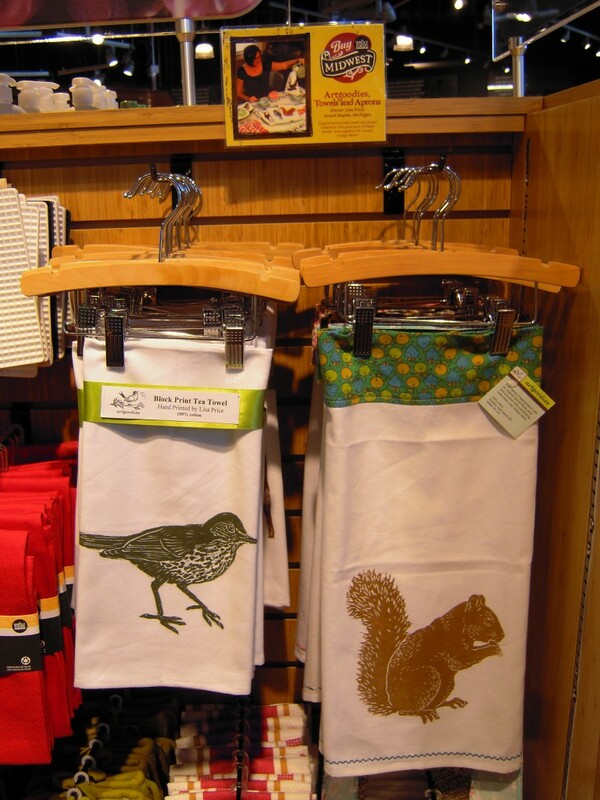 I brought along some different designs than they ordered last to give customers a bigger selection. I also brought one of my blocks to assist customers in understanding my process. Me at the end of the day with my cart of artgoodies! I had a good time talking to customers and also watching people’s produce buying habits, particularly melons, fascinating! I could have a whole post on just that! On the way to our family cottage there's a sweet little apple orchard which I will be posting about this fall. My mom and I stopped by to pick up some apples at the adorable roadside stand. In talking with the guy who runs the joint he told us he had planted 900,000 sunflowers this year around his field of alfalfa. Wowee! It sure makes for a pretty drive down the road to the lake! I stopped to nab a pic and he was gracious enough to let me nab a few stems! Although it’s a little cool and the clouds are about to burst into rain at any moment here’s a spot on the porch that suits me just fine! 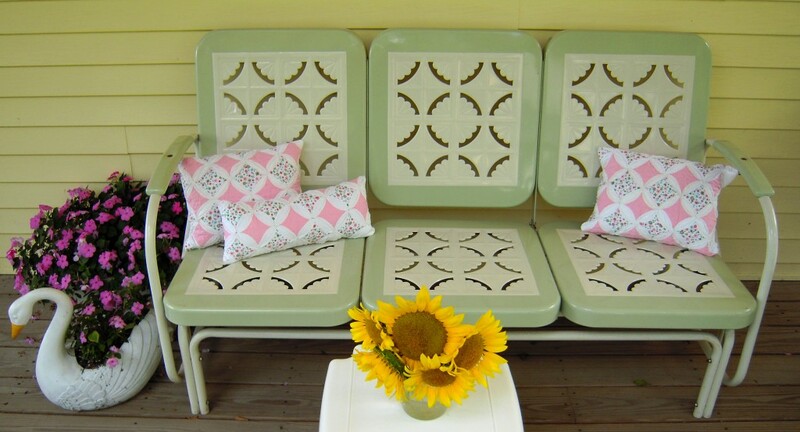 You can’t get much cuter cottage style than this! I bought my mom this repro glider for Mother’s Day a few years back. Every year she plants pink impatients in vintage swan containers and the cute shabby chic cottage style pillows will be available on my vintage shope shortly! I just whipped them up from a very small gorgeous hand sewn quilt. 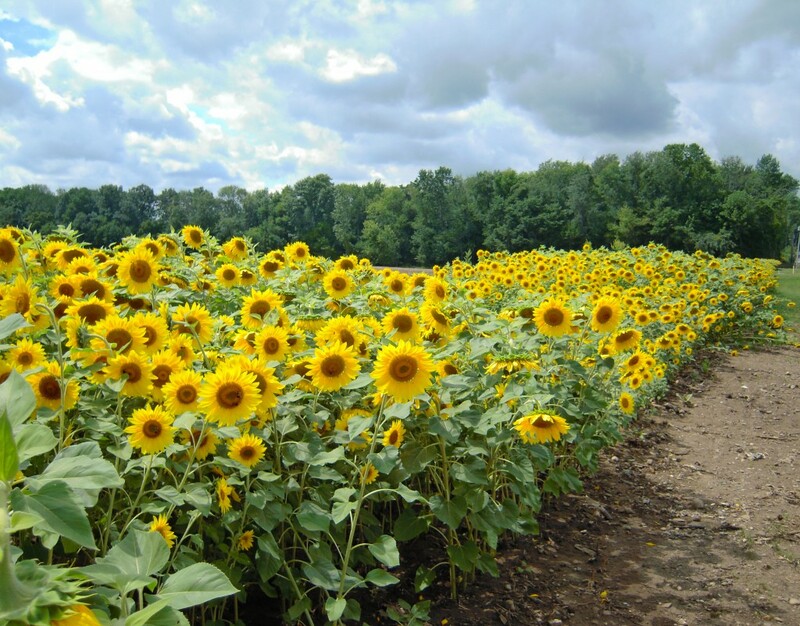 And what’s summer without a bouquet of sunflowers, especially when they are from your local friendly farmer! One of my favorite places Saturday morning is the Farmers Market! 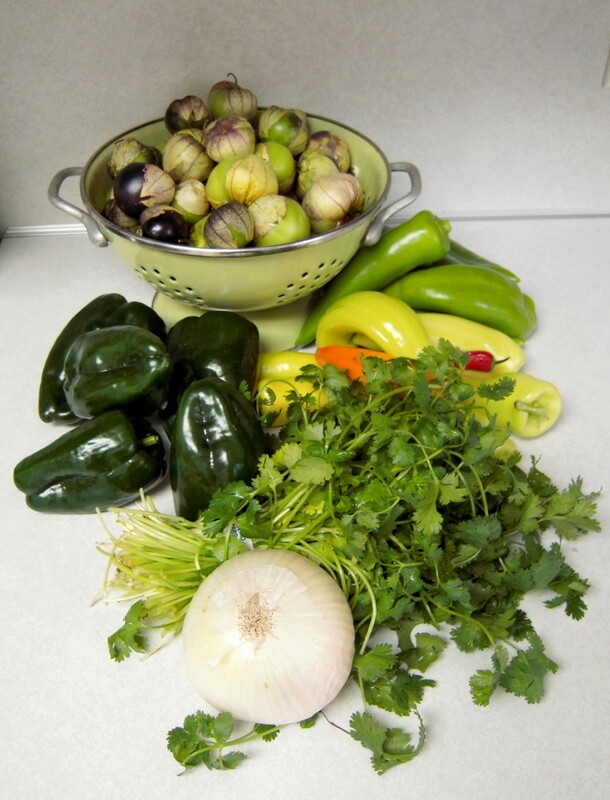 Today I picked up all these ingredients for some super freshy fresh green salsa! I'm allergic to tomatoes so instead I'm using tomatillos. They are related, but in a different genus so no hives for me! I'm also using annaheim peppers, serrano peppers, hot and sweet hungarian banana peppers, cilantro, onion, garlic, salt, lime, and a teeny jalapeno from my own garden. 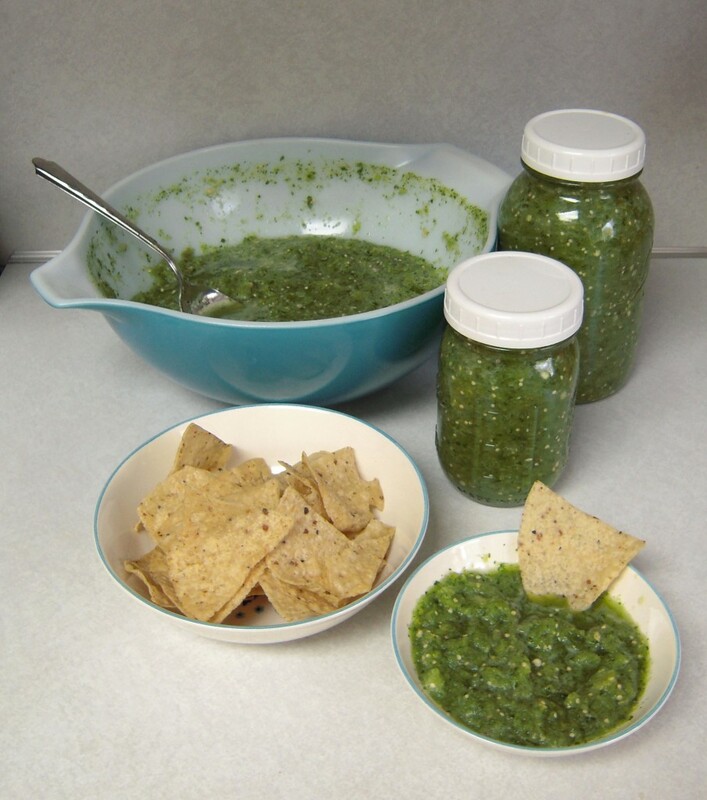 I made the salsa up into small batches combining them into a large bowl. I’m never super precise when I cook so every batch is a little different. I stirred it all together and added another splash of lime and a pinch of salt and voila! A super fresh snack! Finished! 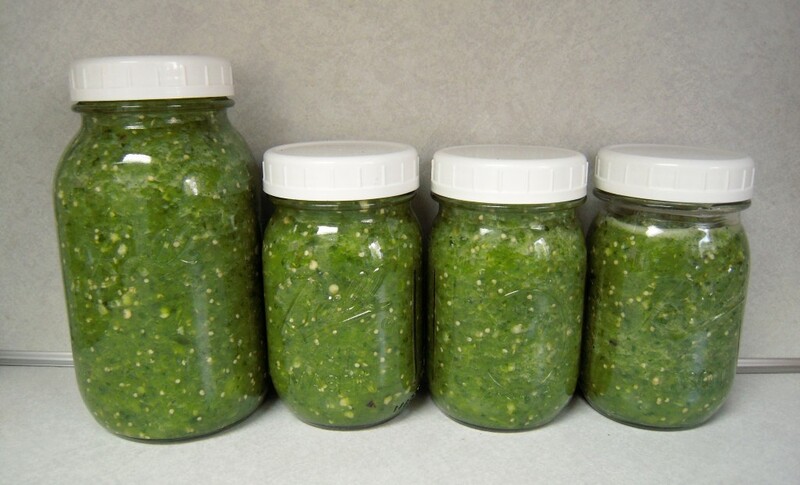 3 pints and 1 quart later I’ve got plenty of salsa for a quick snack, or to add to chili or other recipes. I stick the jars in the fridge for a couple days and then divide them up into smaller batches for the freezer, that way all the delicious flavors have a little time to combine! YUM! and look at that color! I LOVE trays! I accidentally started a collection. I know, accidentally? Honestly, it just happened, and I continue to be a magnet for them. The colors and graphics really grab my attention. 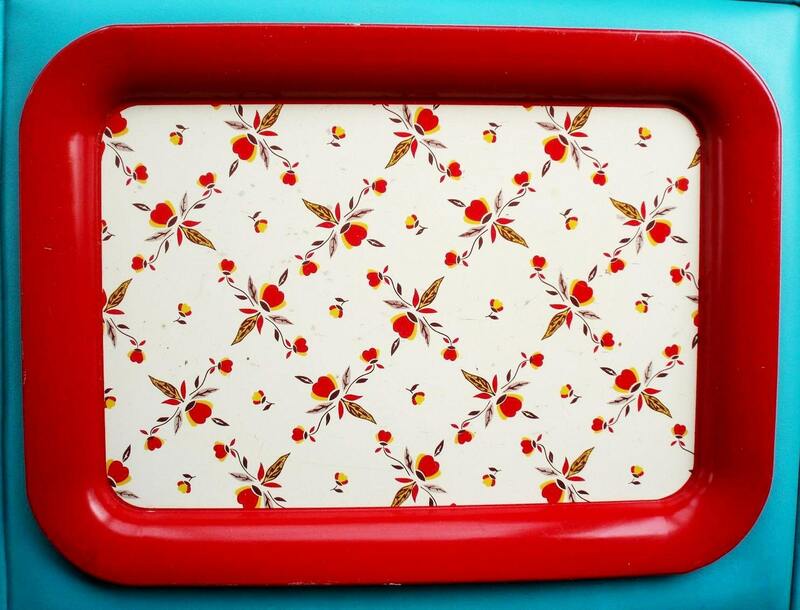 Trays are useful for serving up guests, catching odds and ends, organizing projects, and my favorite home decor! 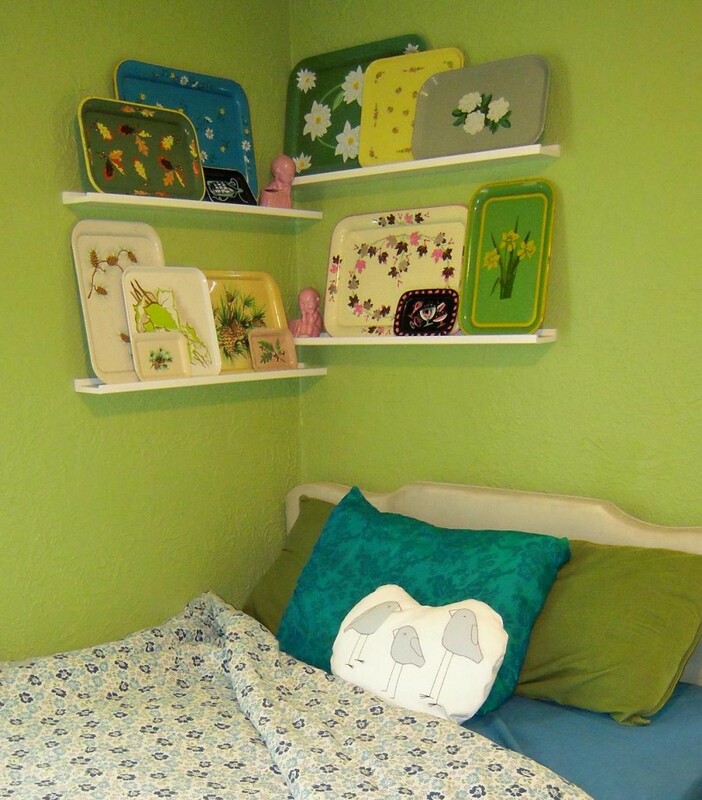 There are lots of ways trays can add a splash of color. Prop them up against a wall behind some plants, hang one on a wall in your kitchen, display some favorite pieces on a side table, or create a little dispay like I have in my bedroom! I love this corner! 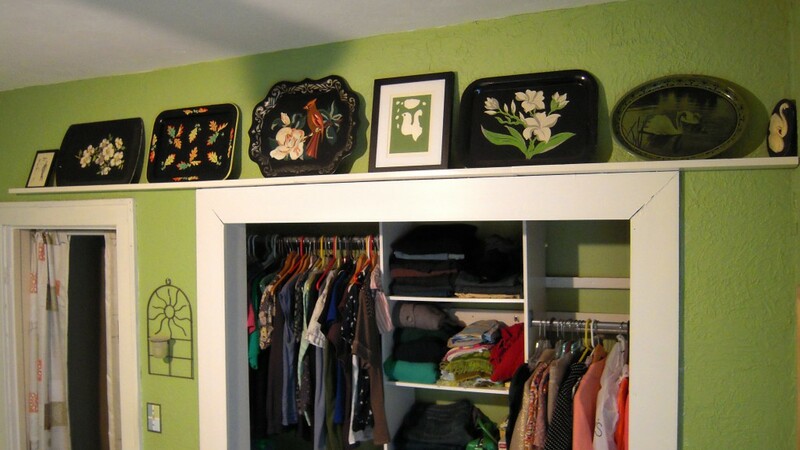 It really makes the room feel complete and adds a lot of charm, not to mention it’s oh SO cute! These are some of my fave trays. Below are a few available in my shop. I actually have an entire section in my shop called trays and tins and I’ve got a pile of beauties just waiting to be added! Afterall, I can’t keep them all for myself! P.S. this is the shot I took for this adorable flower duvet cover, I’ve got 2 of them in my shop! 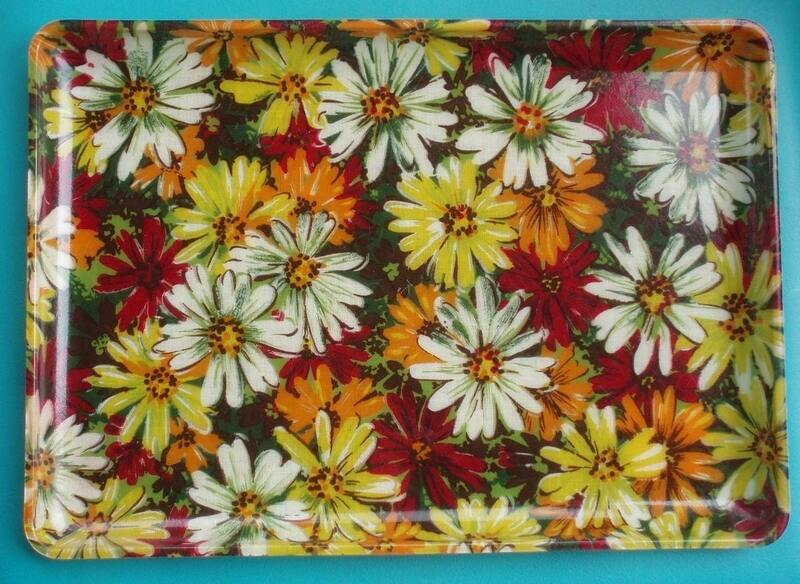 This is a gorgeous large molded fiberglass tray! And I’ve got several available! Gorgeous color and pattern! Believe it or not this one even looks great mixed in with other items at the holidays! Souvenir trays like this one with cupholders are super handy not only for drinks but also for organizing supplies like beads and buttons! 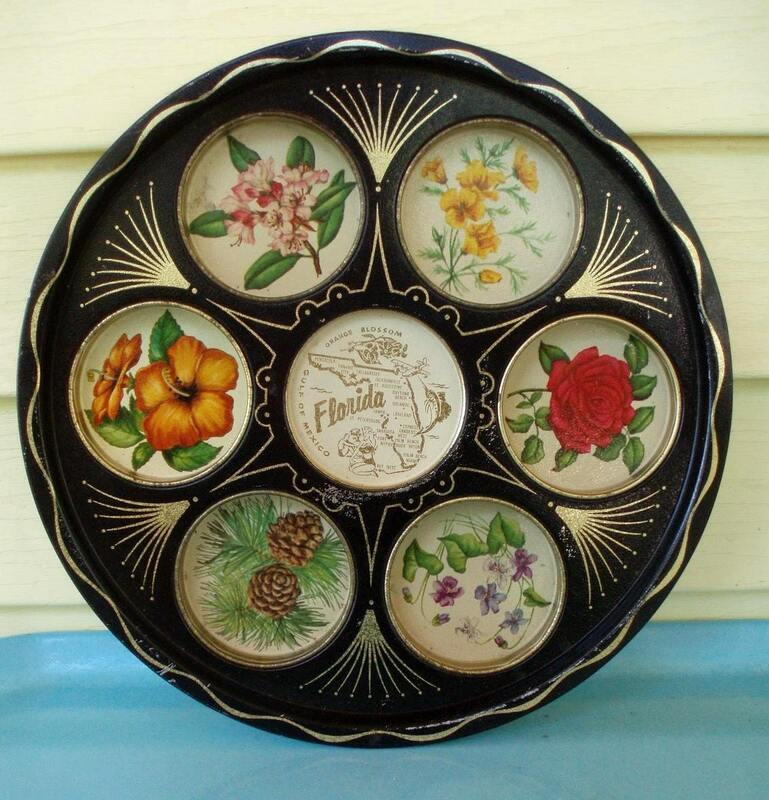 Check out the other state trays in my shop! A totally rare piece from the Jewel Tea Collection made by Hall. This is a gem for a collection and a gorgeous addition if you collect the dishes! I love this! Above my closet I put up some shelves with little ledges meant for holding pictures. I’ve added some of my tray collection in black and greens and mixed in some artwork and a great little swan chalkware piece. I love this easy and cute idea for displaying them! What a great way to add interest to a room while displaying a collection! 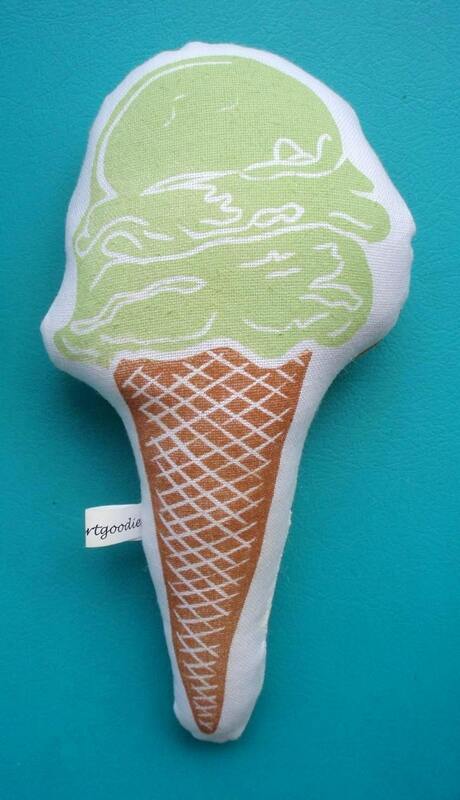 a delicious artgoodies block print ice cream stuffie, and the best part? This treat never melts, so you can enjoy it forever! 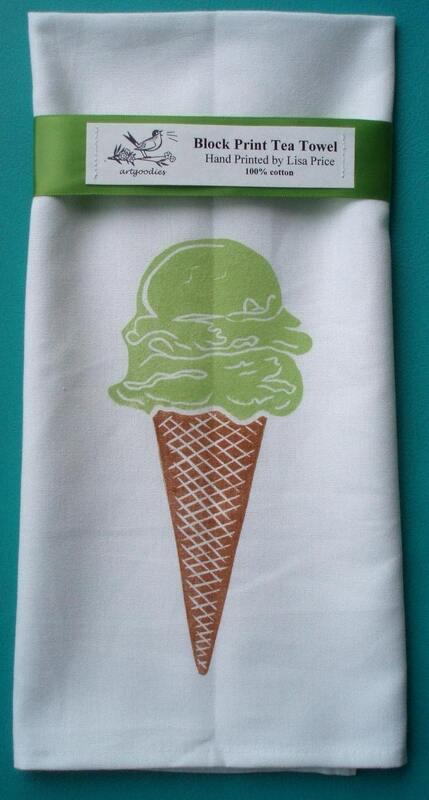 My latest block print design and my first 2 color artgoodies design! The block has been selectively inked to achieve the 2 colors, it takes longer to print but it’s SO delicious! Who can resist a minty fresh treat! The inspiration! 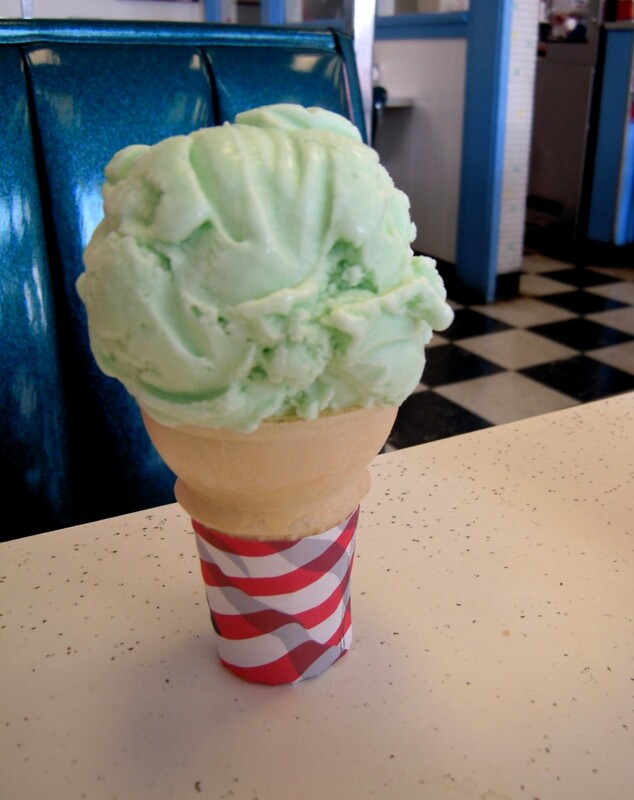 A delicious Bonnie Doon mint green ice cream cone! It happens to be a personal fave! 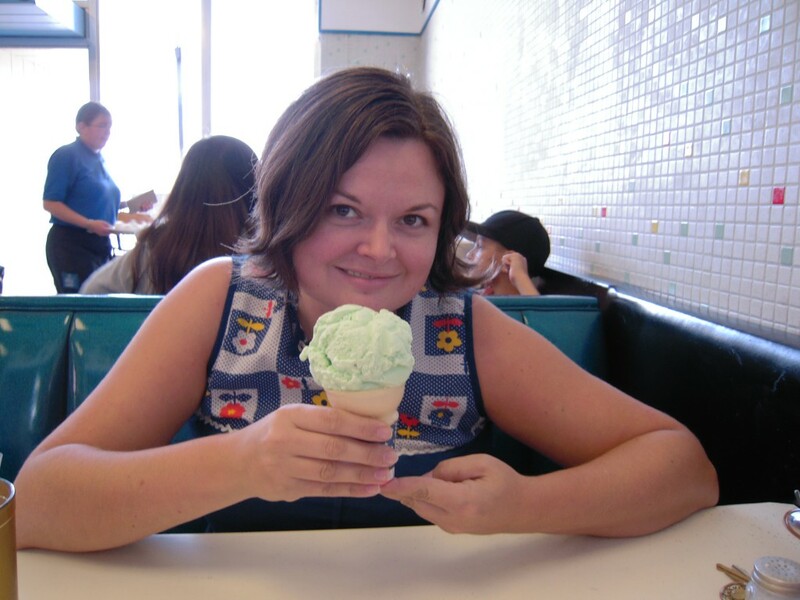 I was in town this past weekend so I got to enjoy a delish Bonnie Doon treat! YUM! 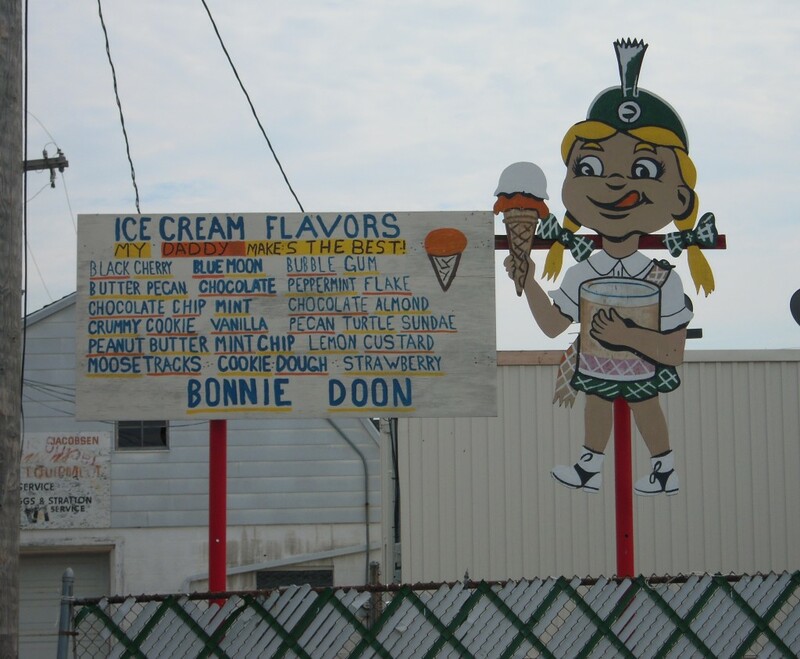 The sign outside Bonnie Doon’s in Mishawaka, IN. We used to go here all the time when we visited my grandma. 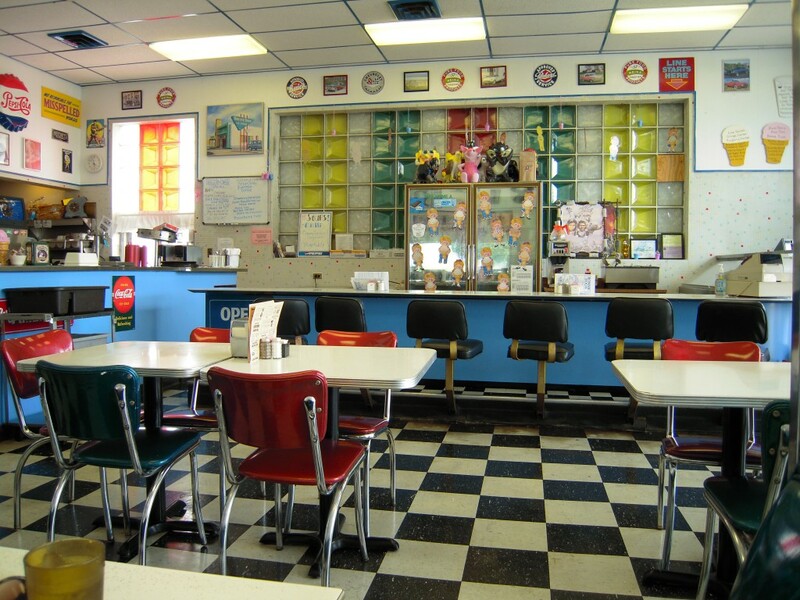 Sometimes we’d eat in but most of the time we’d call in enough burgers and fries for 6 people and some ice cream to go. Yummy! The is the 4th St. location, original decor and all. My mom also grew up going here! What a great spot to hang out after school or when you deserved a special treat! The raker, the baker, and the printmaker. 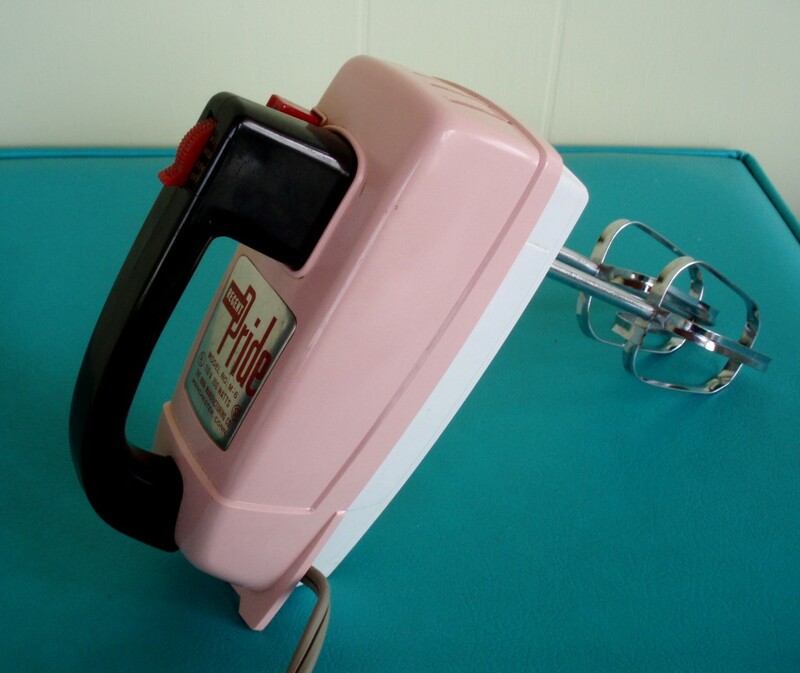 I like old school hand tools and I never wanted an electric hand mixer. Then I found THIS. A pink Regent Pride mixer, I picked it up last summer for a ridiculous $4! It works like a charm and is always ready to help me whip up a treat! After a hard day at work in the studio AND the yard I got a little sugar craving which really is quite unusual for me. My friend Mary stopped by yesterday and we chatted about the cakes she’s been baking. Then I remembered a box of all natural lemon cake mix I picked up a while back ! I mixed it up and divided the batter into small bread pans. Then I made some delish buttercream frosting from scratch. 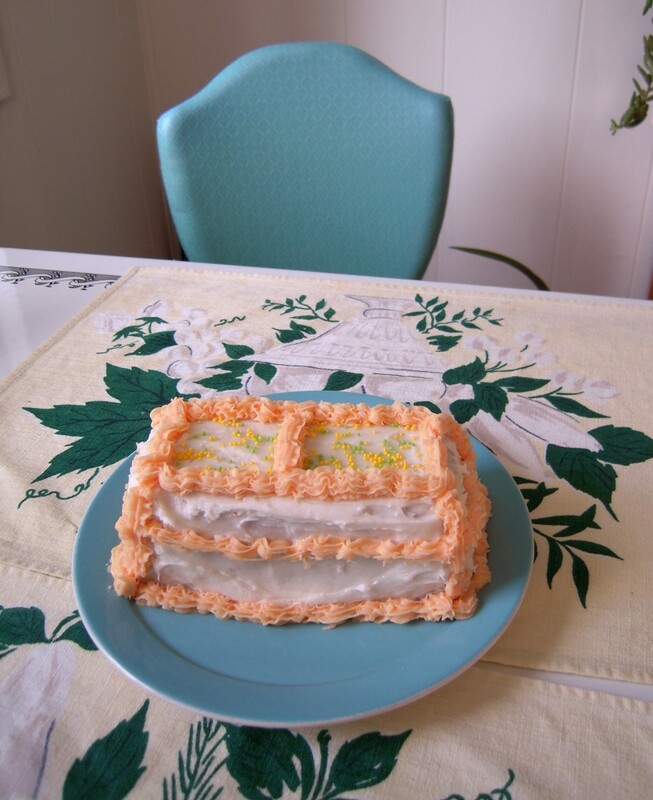 The light peach frosting has some tangerine flavor added in for an extra treat. I was also inspired by a new find, a vintage cake decorating book and remembered I had a little vintage decorator set in the cupboard! I think it turned out so cute! Then when it was all done I dropped this little sweet treat off for a couple of dear friends to enjoy!